The House is almost full as the Speaker of Parliament, Jacob Mudenda walks in. Some opposition backbenchers shout "Safety guaranteed!" as they prepare to hear the national Budget. Government has proposed a cocktail of measures to cut recurrent expenditure, including civil service and diplomatic staff rationalisation, a reduction in the size of the executive, a cut in staff benefits and restrictions on travels in 2018 National Budget proposals announced yesterday. This is part of a new economic order involving the implementation of a comprehensive and coherent expenditure management strategy that reorients resources towards development programmes for the benefit of Zimbabweans, said Finance and Economic Development Minister Patrick Chinamasa. He said measures to reduce the Government wage bill included a freeze on recruitment, retirement of staff above 65 years of age in line with existing policy, the introduction of a voluntary retirement scheme and a cut in staff benefits. This dovetails with President Emmerson Mnangagwa's move last week when he trimmed his Cabinet by 22 percent from 27 to 22 ministers by combining some functions and removing duplication. Minister Chinamasa said redundant officers will be retired. He said Cabinet had resolved to abolish youth officer posts in the Ministry of Youth, Indigenisation and Empowerment by transferring their roles and functions to ward development coordinators in the Ministry of Women, Gender and Community Development with immediate effect. This, Minister Chinamasa said, will rationalise the total youth officers and the ward development coordinators establishment from 7 269 to 3 530, translating to a saving of $1,6 million per month and $19,3 million per annum. 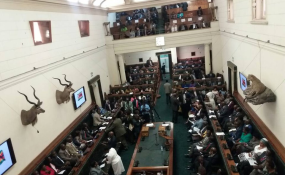 Minister Chinamasa said 528 members of the Public Service without requisite qualifications in terms of Section 18 (4) e (ii) of the Public Service Regulations were being retired. He said Government had reduced fuel benefits across the board and will also cut the number of people who benefit from the personal vehicle scheme. "Currently, too many grades in the Public Service are provided with vehicles as a condition of service every five years, with the vehicles being licensed, insured, serviced and repaired at Government expense," said Minister Chinamasa. "The total outstanding request for condition of service vehicles is now close to $140 million, which the economy in its state cannot afford," he said. He said Government had reviewed the vehicle scheme to allow permanent secretaries and equivalent grades, one personal issue vehicle; commissioners and equivalent grades, one vehicle; and principal directors, directors and deputy directors and their equivalents, vehicle loan scheme. Strict reduction in the size of delegations that travel to regional and international destinations would be restricted to levels that are absolutely necessary where there is diplomatic presence, taking advantage of this to realise representation in outside meetings. "As directed by His Excellency, the President, Government will also be enforcing restrictions on the class of travel on the basis of grade, as communicated through periodic Treasury Circulars to Heads of Ministries. "In this regard, business class travel will, with immediate effect, be restricted to the following categories: Ministers; Heads of Ministries and equivalent grades; parastatals chief executive officers; local authorities mayors, town clerks, chief executive officers; and constitutional commissioners," Minister Chinamasa said, adding all those below the stipulated grades would be restricted to economy class travel regardless of flight duration, with immediate effect. Government also proposed to reduce its diplomatic presence and introduce a ceiling on rentals for foreign missions. Currently, Zimbabwe has 46 embassies and consulates, manned by both home based and locally recruited staff. This was imposing annual Budget support levels of around $65 million, which was far above available capacity, the Minister said. Packages and conditions of service for constitutional commissions would also be reviewed to make commissioners part-time except for the chair and also abolish vehicle benefits. Public enterprises and local authorities would no longer get budgetary support unless they motivated for it by proving that their projects were bankable as part of means to reduce losses, while execution of public sector projects would be done with increased accountability, he said.